If you have a small network at your business or at home, you need help--and lots of it. For your home network, you are by default the network administrator. You may also be the de facto network administrator at work, in addition to the other job titles you could claim. And if you are the acknowledged network administrator, you probably have little or no backup staff. We've found some reinforcements for you. These ten downloads--most of them free, and none of them expensive--will make managing your small network much easier. Anyone who has a home network will welcome Cisco Systems' free Network Magic Essentials, a software collection full of useful tools designed for home network users who don't have IT experience. You'll find a network map for displaying all of the devices on your network, and vital information about each one, including its IP address, hardware configuration, and software configuration. You also get some very good troubleshooters for fixing broken network connections and performing other maintenance tasks. If you manage a work-related network, you may want to step up to the $50 Network Magic Pro. In addition to including all of the Network Magic Essentials tools, it offers support for a larger number of PCs and for network-attached devices, and it provides ways to control Internet access. The Pro version also makes available some excellent network security tools and a network history report that shows bandwidth use by computer. Here's another free, all-in-one network management tool. Spiceworks' IT Desktop is browser-based and offers lots of details about each device on your network--free space, total disk space, what anti-virus software is in use, and even server connection errors, among other information. IT Desktop is harder to use than the Network Magic programs, but its advanced features make it more useful for IT professionals. It also provides an inventory of software on each PC. There's even a Help Desk ticket system for IT staff. For a quick and simple way to assemble an inventory of all of the devices attached to your network--and to find vital information about each one of them--Network Scanner by LizardSystems (free for noncommercial use, $40 for business use) is hard to beat. The utility scans your entire network, and then provides details, including IP addresses, about all of the devices. Network Scanner is particularly helpful if you're concerned about security, because it reports whether remote administration is enabled. The program also lists any publicly shared folders, so you can quickly identify security holes and then close them. 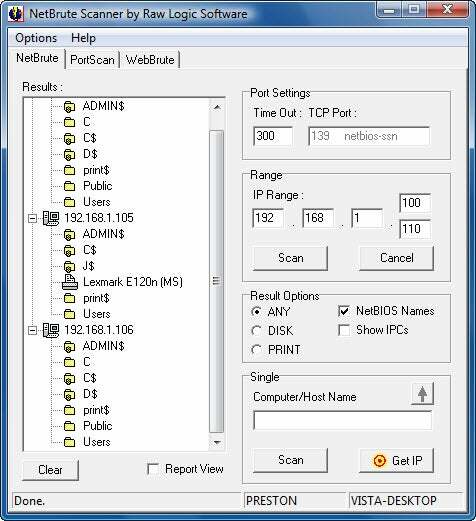 Raw Logic Software's Netbrute Scanner (free) is an extremely useful tool for people who want to test their network's security. It scans all of the computers on a network, and then looks for security holes such as open TCP ports, installed software such as servers and FTP software, and shared folders and resources. Based on what you find, you can reconfigure each PC. Though the vendor's site doesn't list this software as working with Windows 7, I was able to run it on Windows 7 without a hitch. Probably the most common complaint people who use networks have is that the network is too slow. But gauging how fast they really are can be difficult. Also, you might want to know which computers use the most bandwidth. The following tools are great for helping solve these mysteries. Once you've installed Rokario's free Bandwidth Monitor 2 Lite Edition on any PC on your network, it will track bandwidth use in real time. The program displays download bandwidth use, upload bandwidth use, and total bandwidth. It also keeps logs of bandwidth use, so you can retain a historical record. Install it on every PC on your network and then check the results--especially the historical records of bandwidth use--regularly on each PC. That way, you can see whether any bandwidth hogs are wallowing on your network. Based on that, you can try to reduce its excess demand...maybe too much YouTube? 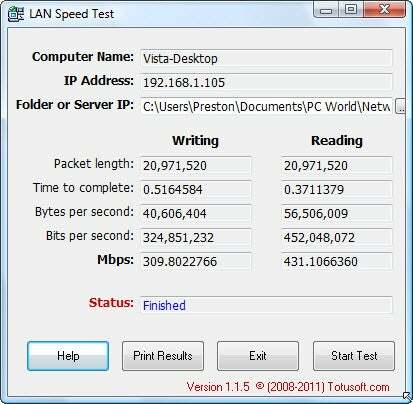 Another useful bandwidth-and-speed tool, Totusoft's LAN Speed Test checks the real upload and download speeds of the network on the PC where it is installed. Load it on every PC on your network, and run it regularly on each one. That way, you can see whether any PCs are having speed problems that may require intervention.